There’s no need for lenticular sheets, Avatar-themed polarized glasses, prisms, or red-blue anaglyph glasses to see the 3-D images in Theo Prins’s DIY stereoscopic paintings. Just go cross-eyed. If you’re doing it correctly, you’ll see three images on the screen. The center image will have depth and the two outer images will not. The hardest part, actually, is to remove your finger and allow yourself to focus on the screen without uncrossing your eyes. 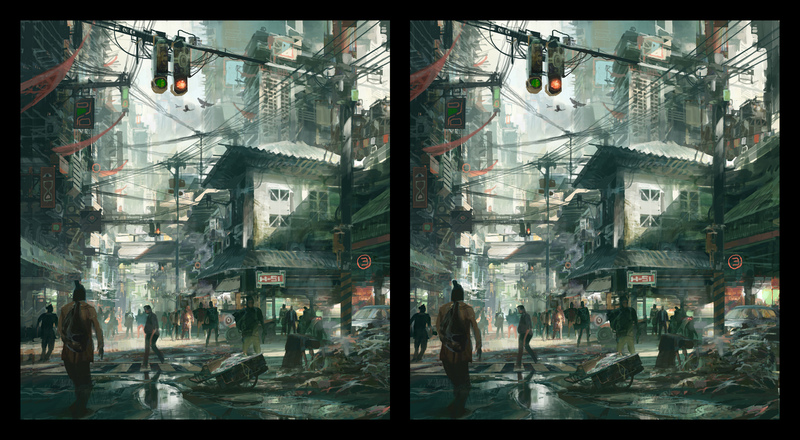 The artist, Washington-based Theo Prins, is one of the few artists making stereoscopic images that can stand on their own as 2-D images as well. How does he do it? After making a digital painting, Prins will create a second, slightly shifted perspective of the same image using Photoshop, which requires isolating each element of the painting onto separate layers, sometimes creating 400 layers for one scene. Then, each of these layers are shifted to expose a gap behind it. (He will also paint behind all of the layers to fill in any gaps.) Then, he’ll duplicate the painting so he has two side-by-side images in order to see the image in 3-D himself, while he shifts each of the layers in the duplicate painting to create the second perspective. Moving each piece horizontally, left or right, either brings it closer in 3-D space or pushes it farther away. Prins says that this method, called “freeviewing,” is his favorite way to look at 3-D images because it doesn’t require any special devices and as such, preserves the original image exactly as one might view it normally in a book or on a screen; the more common methods like lenticular sheets and those red-and-blue glasses make 3-D viewing easier but also usually distort or change the image in some way. But it is more difficult to see the 3-D image using this method, Prins admits, because it involves a little bit of eye strain. “It’s hard to spontaneously tell someone ‘Hey, cross your eyes so these images merge,’ and expect that they’re able to do it,” he tells Co.Design. But not every 2-D painting converts to a 3-D image, Prins says. A bridge off in the distance, like in his painting “Trash,” may have more depth in 2-D, while other objects, like the columns in his “Waterway,” may relate to the other elements around it better. So the more planning he does, and the more detailed he makes the objects as he’s arranging the layers, helps in the end. “Making all these separate elements and objects still feel connected is one of the challenges,” he says. Click here for an extra large version of the topmost image. You can see more of his paintings, stereoscopic and otherwise, here.